SIERRA LEONE is our chosen charity for the 2014/15 Season, as voted for by Members in attendance at our AGM in September 2014. As many of you know, we support and are in constant contact with Armani who runs the football team out there. He pays his players and ensures their education, which is something that other team managers do not do. Armani has been supported by MCFC in past years, along with ourselves. Money was raised and a minibus was bought for use of the team on match days and as community transport all other days. This is how Armani makes money to pay his players. Unfortunately the bus was evolved in a crash and needed work on it to make it roadworthy again (and luckily the driver has recovered too). Sierra Leone was hit by Ebola. This has had a huge impact on the whole country. Football isn’t being played as groups are not allowed to meet. This has meant no income for the players. Also, the bus hasn’t been able to run for the same reason, so Armani is not making an income. This season, we aim to raise as much money as possible to send over to Armani to help rebuild what has been lost during the Ebola crisis and the desperation and struggles it has caused the community. Our very own Branch Secretary Howard Burr completed the Manchester 10k run and has collected a massive £1294.70 in sponsorship money! Well done Howard!! Branch Member Cath Potter, has signed up for The Great Manchester Swim in July. She’s been collecting sponsor money also. Unfortunately, due to Cath having to have an unexpected operation she is unable to participate in the actual event. She asks that all the hours and miles of practice will count towards completion. If anybody would like their sponsorship back, Cath is happy to return it. She is devastated that she will not be competing, especially as she’d cracked swimming the mile in 42 minutes! We thank you Cath for all of your effort and wish you a speedy recovery. Cath recovered quicker than was expected and completed the Great Manchester Swim 2015! 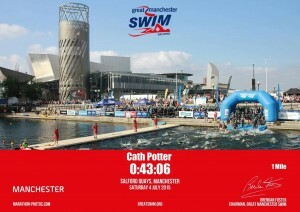 Well done Cath! What an achievement! 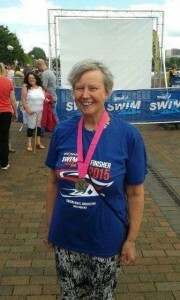 Here’s Cath with her finishing medal and her record of completion . . . The total amount raised for Sierra Leone is an amazing £1858.00! If you attended our Quiz Night with Paul Lake, you would have heard our Tony Griffiths explaining that Sierra Leone are now free from Ebola but have been hit by horrendous floods that have killed many. With some of the money raised, Armani has bought a new goal keeper for the team.